Thanks to YouTube, many older TV shows and movies are now viewable, though their technical quality can be lacking. 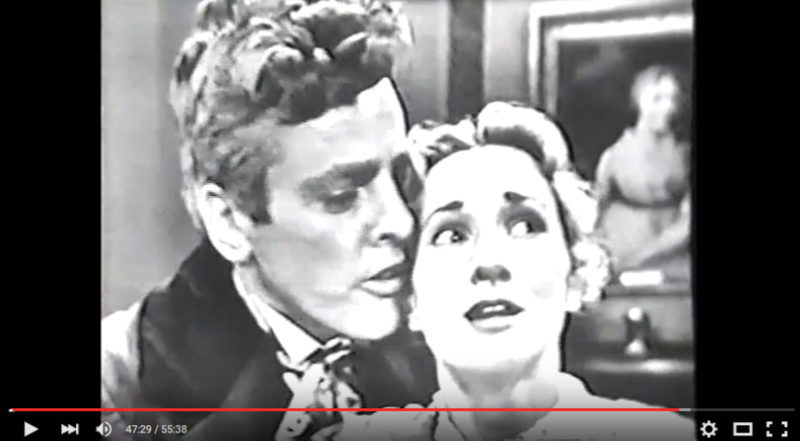 I was pleased to find on that video site a copy of the 1952 TV treatment of Jane Eyre, part of the "Westinghouse Studio One Summer Theatre" series. It is available here. As that title implies, our heroine's atmospheric tale is interspersed with ads for Westinghouse appliances. (The same was true of the 1949 version, also sponsored by Westinghouse. In fact, though they were created by different writers, the two versions' plots are quite similar.) You'll be glad to know that with a Westinghouse, unlike those other firms' refrigerators, you never have to empty the defrost tray by hand. This was an hour-long program; not counting ads, the movie occupies about 50 minutes. Naturally, that means that substantial chunks of the plot were discarded. Jane begins the film with a voice-over: "I can never return to Thornfield Manor." She makes an oblique reference to "my bleak past" at Lowood School, but the viewer never learns why it was bleak or what her pre-Lowood childhood was like. No objection here; the story editor slashed as needed. The tale is further compressed: Jane meets Adele as soon as she arrives at Thornfield; she hears eerie laughter on her first night there; on her second day, she encounters (just outside the Manor) a fellow who is limping because his horse has thrown him, and Mrs. Fairfax quickly appears and addresses him as Mr. Rochester. As usual in shortened versions, Rochester's affection for Jane (and vice versa) apparently spring up full-grown. The mysterious attic dweller sets fire to a curtain near where Rochester dozes in a living room chair; Jane shakes him awake, and soon he is clinging to her hand as she tries to depart. A brief visit from his society friends, including the lovely and talented Blanche Ingram, results in Jane departing the room where Lady Ingram has been disparaging governesses; when Rochester confronts her about it, she weeps. The wedding ceremony begins outside Thornfield, with no witnesses apparent (just the two of them and the minister). After Mason's solicitor, Briggs, appears and announces an impediment, those two men drag Bertha down from the attic; she acts like a petulant child, moaning "I don't wanna go." After Jane departs Thornfield in the wake of this disastrous day, we see Bertha igniting the wedding dress, the Manor going up in flames, and Rochester re-entering to try to save the madwoman. Then Jane is shown in some unknown place, hearing him calling for her. She returns to Thornfield, where only the west wing has been burned; as she talks to Mrs. Fairfax, Rochester comes tapping along with his cane. Once she reveals her presence to him, he speaks of the sweet delusion, but never questions why she would want to be with a lameter like himself — he simply says her name over and over, as she swears she'll never leave him. Cue swelling orchestal flourish and fade to black. There is a saying in chess: what matters is not which pieces are captured and removed, but which pieces remain on the board. In that spirit, I will focus less on what was excised from the plot (the Reeds, Lowood, the Riverses, etc.) than on the quality of what remains. This abbreviated treatment does give a reasonable flavor of the Jane Eyre story, covering the broad sweep of love and jealousy and betrayal and redemption. The emotional aspects most shabbily treated are the sense of Jane's insecurities (we never understand how deeply she views herself as "poor, obscure, plain, and little") and the slow development of the protagonists' feelings for each other (rendered in fast motion here). While the actors are competent, they don't do the tale any great service. Katharine Bard, a little too old and a lot too pretty to be Jane, spends much of her screen time alternating between two main feelings: confused dismay and rapturous glee. Kevin McCarthy is more dapper and mannered than the Rochester we know, who has a "grim mouth, chin, and jaw" and is "broad chested and thin flanked, though neither tall nor graceful." While the film's Rochester is bossy and peevish, his smile shines out too readily. Despite the washed-out quality of the black-and-white video footage, this short Jane Eyre film made a fairly pleasing impression. For a less-than-an-hour version made (presumably with a low budget) to sell refrigerators and TV sets, it comes off as not nearly as bad as it could have been. Worth a look-see.